"storage locker" redirects here. For small lockers, see locker (cabinet). Self storage (a shorthand for "self-service storage", and also known as "Device storage") is an industry in which storage space (such as rooms, lockers, containers, and/or outdoor space), also known as "storage units" is rented to tenants, usually on a short-term basis (often month-to-month). Self-storage tenants include businesses and individuals. Although there is historical evidence of publicly available storage in ancient China, modern self-storage facilities (in which the tenant has exclusive access to the storage space) did not begin to appear until the late 1960s. The first self-storage facility chains opened in Texas. Modern storage facilities grew slowly through the 90s, at which time demand outpaced supply and caused a rush of new self-storage developments. From 2000 to 2005, over 3,000 new facilities were built every year in America. At year-end 2017, a total of between 44,000 and 52,000 self-storage facilities have been developed in the United States on industrial and commercial land parcels. There is more than 2.3 billion square feet of available self-storage in space in U.S., or a land area equivalent to three times Manhattan Island under roof. The six largest publicly traded storage operators (four REITs, and U-Haul own or operate approximately 18% of self-storage facilities. The industry is worth $38 billion in 2018. More recently, in many metropolitan cities where competition among storage companies is fierce, better parcels of land near residential and commercial areas are being converted into self-storage once approved by zoning panels. Companies are becoming more adept at manufacturing these modular storage units, allowing operators to get up and running quickly. To support the need, businesses like PODS are expected to enter the modular construction effort as well. 20x20, about the size of a two-car garage. The storage units are typically window-less, walled with corrugated metal, and lockable by the renter. Each unit is usually accessed by opening a roll-up metal door, which is usually about the same size as a one-car garage door (smaller units may be accessed by a hinged metal door). A controlled access facility may employ security guards, security cameras, individual unit door alarms and some means of electronic gate access such as a keypad or proximity card. A few facilities even use biometric thumbprint or hand scanners to ensure that access is granted only to those that rent. Self-storage facility operators frequently provide 24-hour access, climate controlled storage, outdoor storage for RVs and boats, and lights or power outlets inside the storage unit as amenities to set themselves apart from competitors. Some storage facilities have open roofs i.e. a wire mesh roof which are not that secure, compared to ones that have full covered tin roofs that provide added security and privacy. Example of an older, urban self-storage facility. In rural and suburban areas most facilities contain multiple single-story buildings with mostly drive-up units which have natural ventilation but are not climate-controlled. These buildings are referred to as "traditional" storage facilities. Climate-controlled interior units are becoming more popular in suburban areas. In urban areas many facilities have multi-story buildings using elevators or freight lifts to move the goods to the upper floors. These facilities are often climate-controlled since they are comprised mostly, if not totally, of interior units. Warehouses or grocery stores are sometimes converted into self-storage facilities. Loading docks are sometimes provided on the ground floor. Also, complimentary rolling carts or moving dollies are sometimes provided to help the customers carry items to their units. Urban self-storage facilities might contain only a few floors in a much larger building; there are successful self-storage businesses co-located with manufacturing plants, office tenants and even public schools. Over 54,000 self-storage facilities currently exist in the U.S. ranging from companies with a nationwide presence to companies with regional footprints or even stand-alone independent "mom and pop" facilities. Demand for storage space remains stable as of Q4 2015. The supply for self-storage is also relatively stable. Often, the process to build a new storage building is onerous and can take years. Additionally, this specific asset class often gets push back from communities, due to its nature. The self-storage sector is highly fragmented, which is in contrast to other asset classes in the industry. 80% of self-storage facilities are owned by individuals or small investors. There is a belief amongst investors that the self-storage industry is recession-proof. This belief is supported by the 5.1% total return the sector delivered to investors in 2008. Facilities owners are generally required to first notify the tenant of the outstanding debt, commonly by certified or registered mail to the address on file with the facility. If the debt remains unpaid, the facility must then give public notice of the sale or auction, generally in a newspaper of general circulation in most states, though some states may allow public notice of sales to be done in the internet. The tenant has the right to pay their outstanding bill at any time until the moment the auction begins and thus reclaim rights to the unit and his/her items; those units would be removed from the auction (which, in some cases, may result in the entire auction being cancelled). In the fall of 2010, two new television programs featuring storage auctions, Storage Wars and Auction Hunters, were released. The popularity led to additional shows such as Storage Hunters, Storage Wars: Texas, and Storage Wars: New York which helped increase the visibility and interest of storage auctions. Storage Wars: Canada also debuted on the Outdoor Living Network in 2013. 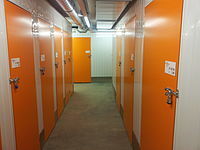 Wikimedia Commons has media related to Self storage buildings. ^ a b "U.S. Self Storage Industry Statistics". Sparefoot.com. 2018-03-01. Retrieved 2018-03-13. ^ a b Pleven, Liam. "Need to Store That? Booming Self-Storage Industry Says No Problem". Wall Street Journal. ISSN 0099-9660. Retrieved 2015-10-23. ^ "Industry Statistics Sampler: NAICS 531130 - Lessors of miniwarehouses and self-storage units". Census.gov. Retrieved 2012-02-01. ^ Vanderbilt, Tom (2005-07-18). "Self-Storage Nation - Americans are storing more stuff than ever". Slate. ^ Mooallem, Jon (2009-09-02). "The Self-Storage Self - Storing All the Stuff We Accumulate". NYTimes.com. Retrieved 2012-02-01. ^ Sisson, Patrick (27 March 2018). "Self-storage: How warehouses for personal junk became a $38 billion industry". Curbed. Retrieved 27 March 2018. ^ "U.S. Self-Storage Industry Statistics". SpareFoot. May 26, 2015. Retrieved June 16, 2015. ^ "Traditional self storage VS mobile self storage". hillsselfstorage.com.au. 2012-05-01. Retrieved 2018-05-23. ^ "SSA | Home" (PDF). Selfstorage.org. 2005-04-19. Retrieved 2012-02-01. ^ "Industry Facts & Figures". SelfStorage.com. 2013-04-29. Retrieved 2013-05-01. ^ "Self-Storage Industry Statistics". Retrieved 2016-02-29. ^ Friedman, Robyn A. "Investors Gird for Storage Wars". Wall Street Journal. ISSN 0099-9660. Retrieved 2015-10-23. ^ "European Self Storage Annual Survey 2014" (PDF). FEDESSA. 2014-10-01. ^ "Storage price comparison 2018". easyStorage. ^ "SSA Lien Laws". Self Storage Association. Retrieved 2015-02-18. This page was last edited on 19 February 2019, at 05:32 (UTC).